I have to be honest: God doing “something new” in my life does not always feel so pleasantly poetic. In fact, sometimes the “springing up” is alarming and unwelcome. It’s more like a storm appearing out of nowhere the day you forgot an umbrella; like mustard springing out in an unexpected squirt right onto a clean white shirt; like (yes, I’m going to use this example) your period coming the very morning that you’re set to leave for a beach vacation. Wah-wah. Four years ago, I was sitting on a beach in a town called Crucita on the coast of Ecuador. After a very formative college experience at the University of Dayton, I had come to this South American country as a volunteer with a program called Rostro de Cristo. On that particular November day in Crucita, I was on retreat with the ten other young adult volunteers and our Director, Megan. We were a few months into the year and all still trying to make sense of it. I stared into the eternal blueness of the ocean, missing my family, friends, and the boyfriend I had broken up with in August. There it was - unexpected rain; stray mustard; untimely monthly visitor. I think I actually swiveled around, looking for the person who spoke the words, because I certainly would never say or even think them. Although I had always admired religious women, becoming one is not something I had ever considered. “You should be a nun.” I was puzzled and upset by the strange message but didn’t give much thought to it right away. That was 2008. This summer, on June 24th, I made my commitment as an Affiliate with the Sisters of Charity of Cincinnati. Much has transpired in the almost four years since that first alarming thought on Crucita beach. God has certainly made new pathways in me, and I feel ready. This ceremony marks my entrance into the community and the beginning of my first year of official formation on the road to becoming a Sister. Thankfully, I won’t be walking alone. Andrea Koverman became an Affiliate on June 24th as well. She is an amazing teacher, friend, and radiant force of joy and compassion. We will be companions on the journey, supported by the wisdom of the 300+ inspiring Sisters who have so lovingly welcomed us into their family. 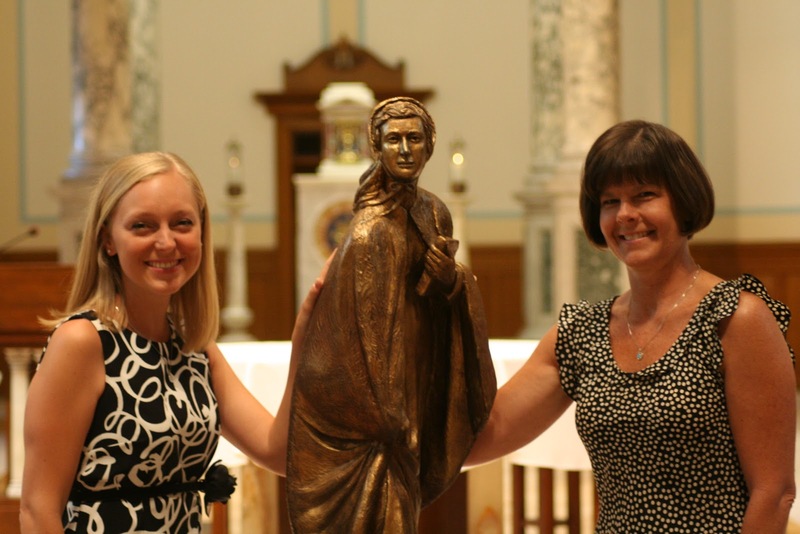 Tracy (left) and Andrea with St. Elizabeth Ann Seton (Sisters of Charity foundress). Many people with whom I’ve shared my story are surprised that a 26 year old (or anyone for that matter) would make this choice right now. Not only is it uncommon and quite counter-cultural; the climate surrounding religious life and the Catholic Church these days isn’t exactly peaceful and peachy keen. It sometimes feels like our Church is sitting on a fault line between two gnashing tectonic plates. There is much discord and division. However, I can see a hint of brilliant green poking through the soil, ready to blossom at any moment. “Something new” doesn’t always feel comfortable, as I and I’m sure many others can attest to from experience. And sometimes the discomfort lasts for a very long time. But conflict and movement are signs of an eventual transformation and springing forth, like water gurgling furiously through a rocky precipice until it emerges as the breathtaking spray of a waterfall. Sister Lois, a member of the leadership council of the Sisters of Charity, read the passage from Isaiah as part of Andrea’s and my Affiliation Ceremony. “See, I am doing a new thing! Now it springs up; do you not perceive it? I am making a way in the desert and streams in the wasteland.” I bowed my head and smiled gently as the words washed over me. Ahhhh. 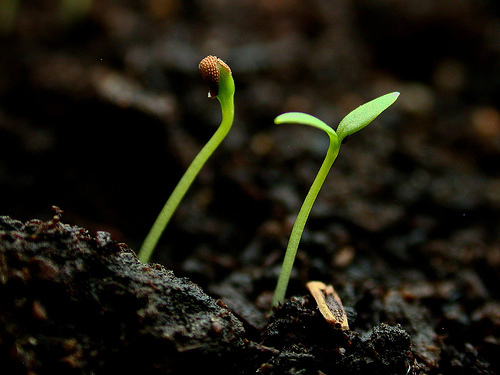 There it was - the good kind of springing forth. Butterflies unleashing into the big blue sky of my heart. It is an exciting time to be setting out on this journey, and I invite you to take it with me! Perhaps you are curious what the life of a (future) Sister might look like in the 21st century. Perhaps you are considering this beautiful path for yourself. Perhaps you think I must be crazy to give my whole life to this. Whoever you are, thank you for reading. I hope that my reflections inspire something new in your own seeking and journeying. God is always doing something new – in our world, in our Church, and most profoundly, in the intimate places of my heart and your heart. Now it springs up; can you not perceive it? !